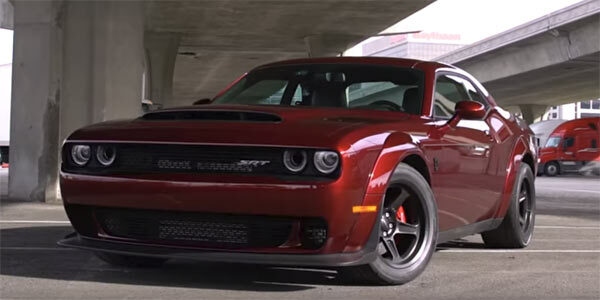 Commuting in a 840hp Dodge Demon. Can It Be Done? Having a car primed for the dragstrip is great, but in theory what would it be like to commute with or just pop to the grocery store? This job is clearly down on its list of priorities but being a street legal car, it should have this function in its repertoire as with any other ultrahigh performance vehicle. Otherwise, why not just buy a dedicated drag car? James Pumphrey puts this to the test in his unique style and sees what 840hp is actually like driving on a daily basis. Suffice to say with this much power and speed the world seems twice as slow and boring. A bit like driving in custard if that’s a thing. Your just far too quick and powerful for this environment. So the Dodge Demon can be used as a daily commute. You can take the kid(singular) to school in this car( if you have the other seat in there), but just like those weird fish that can survive a bit out of water, the Demon eventually has to go back to its original habitat. It’s still good fun to see this monster of a muscle car in all environments, especially being so limited-edition. With the upcoming Redeye Hellcat, this should bring a more driveable version of the Dodge Demon and a Hellcat that is more close to the Demon in sheer madness. Related ItemsCommuting in a 840hp Dodge Demon. Can It Be Done?